Maiden Probable Reserve Statement 755 million tonnes (MT) at 14.7% Davis Tube Recovery for 111 million tonnes of high quality concentrate. Maiden Probable Reserve Statement of 755MT at 14.7%DTR for 111 million tonnes of high quality concentrate. Emerging iron producer Carpentaria Resources Limited (ASX:CAP) announced today a new prefeasibility study for its flagship Hawsons Iron Project joint venture near Broken Hill (ASX:CAP 68.7%, Pure Metals P/L 31.3%) which has elevated Hawsons to the front of the development queue for high-quality iron ore projects. The Hawsons project prefeasibility study (PFS) was completed by independent consultants GHD and the results show robust project economics for production of 10 Mtpa of the world-leading Hawsons Supergradeâ product for steel makers based on assumptions below. Carpentaria’s Managing Director, Quentin Hill, said the results established the project’s position as the world’s leading undeveloped high quality concentrate and pellet feed project. “This is a major step forward for what could become a decades-long operation for Broken Hill. Blue-chip steel makers from Asia and the Middle East have already oversubscribed for our initial planned production, and Hawsons is now extremely well positioned to attract the necessary investment to advance towards mining,” he said. Carpentaria’s Mr Hill said the delivery of a PFS indicating financially robust results and a Maiden Probable Reserve Statement is the biggest step towards the project’s development thus far, laying the foundations to attract funding for a bankable feasibility study. 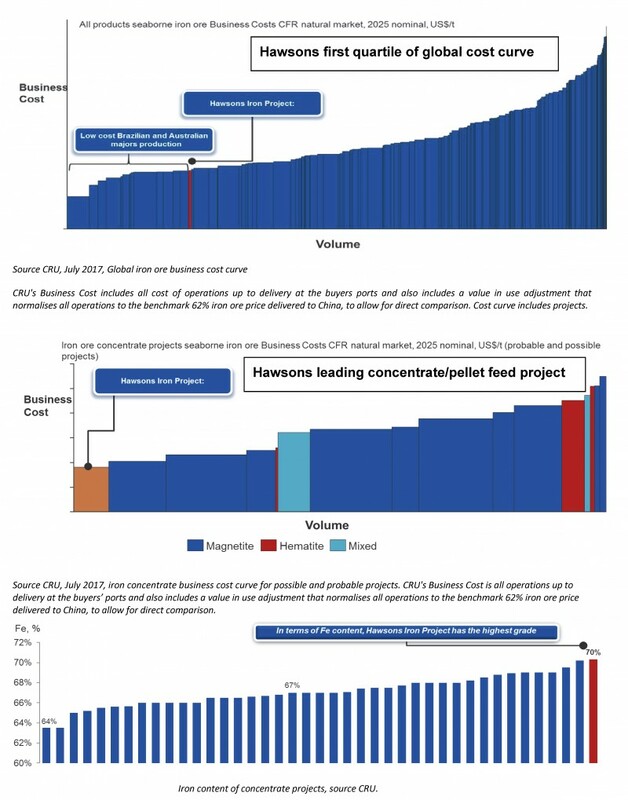 “This successful prefeasibility study delivers an attractive development case for Hawsons under long-term iron ore price forecasts, and importantly a cost structure in the first quartile of the global iron ore cost curve (see page 4) that means cash flow is likely sustainable through the commodity cycle. These results substantially lift the investment grade and the strategic value of the project,” Mr Hill said. “We are delighted to have met the lower end of our cost targets and the project is now well positioned for ongoing development. These results are for a base case exporting through Port Pirie and we will seek to improve on the base case and optimise the project configuration, lowering costs and development risk where possible. “Hawsons benefits from world-leading all in business costs (see page 4) and a highly competitive capital intensity and we are expecting strong interest in these results from the global iron ore and steel industry. Steel mill profits are improving and the industry is now once again seeking solutions to maintain productivity over the long term as the quality of iron ore globally continues to decline. We have positioned the project as a valuable, real and attractive high quality option to meet those needs. Hawsons is the right project at the right time”. GHD’s study was completed to a +/- 30% accuracy with inputs from Carpentaria, other consultants and infrastructure and equipment suppliers. The project configuration and design maximise the advantages of Hawsons’ soft ore and its location close to existing infrastructure. The engineering study also utilised advances in design and manufacturing technology where appropriate, while allowing for appropriate contingency, design growth and engineering procurement and management (EPCM). Carpentaria now plans to present the results of the report to, and seek support for the next stage of project development from, its seven blue-chip customers that have signed non-binding letters of intent (LOIs) for purchase of the Hawsons Supergradeâ product, as well as other steel makers, buyers and financial institutions who have shown ongoing interest in the project. Initial discussions have been encouraging and a data room will soon be open. 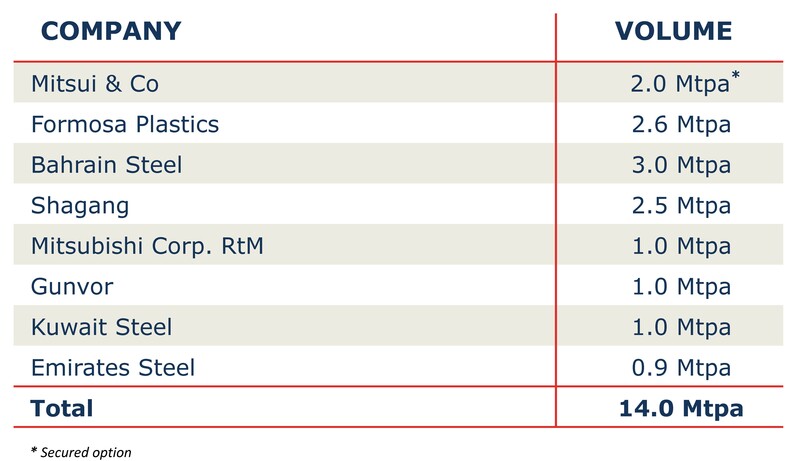 Current LOI customers comprise Bahrain Steel, Emirates Steel and Kuwait Steel from the Middle East; China’s Shagang International; Japan’s Mitsubishi Corporation RtM; Taiwan’s Formosa Plastics; and Gunvor Group. Collectively, they have signed LOIs for a total of 12 Mtpa of Hawsons Supergradeâproduct, accounting for 120% of the PFS’ target production. “We are focused on ensuring this project delivers maximum benefits to all stakeholders, including new jobs and investment for Broken Hill and increased wealth for our shareholders,” Mr Hill added. Hawsons’ product iron grade is the highest of all concentrate products worldwide. CRU has forecast sustained modest long-term growth in steel demand, and identified that iron ore pellet feed/pellets are likely to be the highest growth segment of the iron ore market at a compound average growth rate to 2030 of 3.4% globally. This is primarily driven by growth in Chinese pellet demand fuelled by consolidation and increasing efficiency of the Chinese steel industry, but also by significant expansion in the Middle East and Latin America. These factors all underscore that Hawsons is well positioned for development and has increasing strategic value that is yet to be realised. The study investigated production of 10mtpa of Hawsons Supergrade® concentrate production for a mine of 20 years production for 201Mtpa. The ore is to be mined and processed on site, with the final mineral concentrate being transported via slurry pipeline to a rail head site near Broken Hill. Concentrate will then be dewatered and transported on the existing rail to Port Pirie, where a port upgrade including storage sheds, pipe conveyor and new ship loaders is proposed. Ore would then be transported via barge to capesize ocean going vessels for delivery to export markets to customers in the Middle East and East Asia. Assumptions such as pricing for iron ore products and exchange rates are as set out in this announcement. The classification of the resource estimates is based on the data distribution, which is a function of the drillhole spacing, the style of mineralisation, the geological model, the QAQC programme and results and comparison with previous resource estimates. Drill hole spacing was nominally 200m x 200m or 200m x 100m for Indicated Resources and up to 400m x 200m for Inferred Resources. The mining method will be a bulk mining method via an open pit operation and the resources have been classified according to this assumption. As a result of the above classification, a new updated Mineral Resource for the Hawsons Magnetite Project has been estimated and was reported (ASX Announcement 21 June 2017). 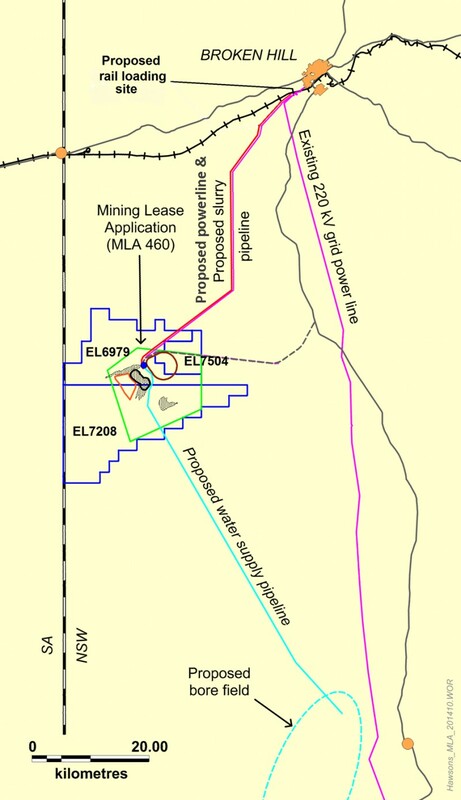 The estimates are reported for a 9.5% Davis tube recovery (DTR) cut off, as advised by the Company, from within the fresh rock zone vertically above the -240mRL. 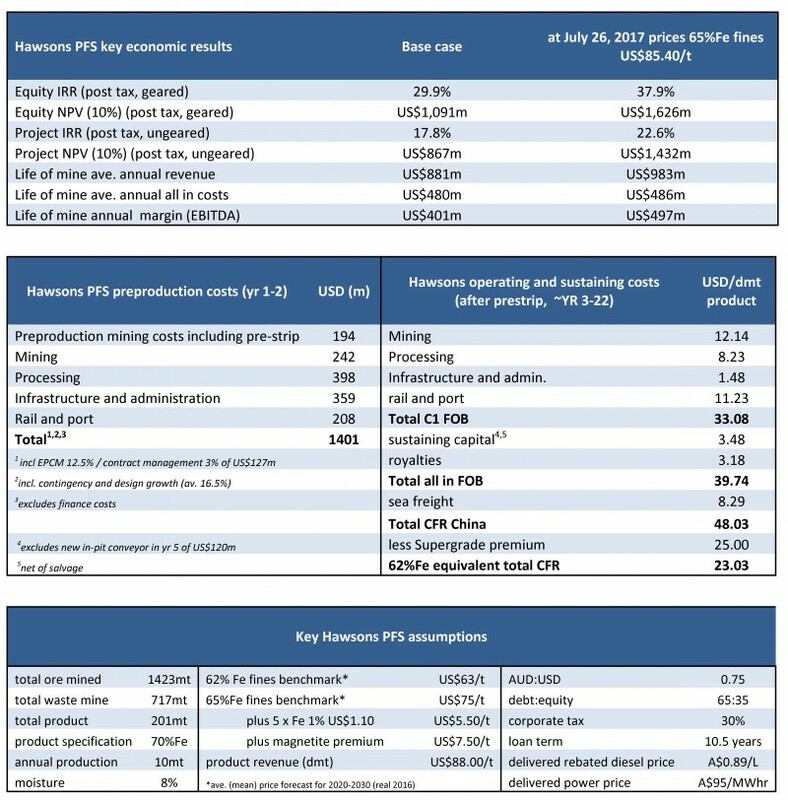 optimisation were revenue based on 62%Fe price of US$60/t (converting to a 65%Fe price of US$70/t), with mining and processing costs being derived from previous mine planning and processing test work. The Company has a high level of confidence in the modifying factors applied in the estimation of reserves. 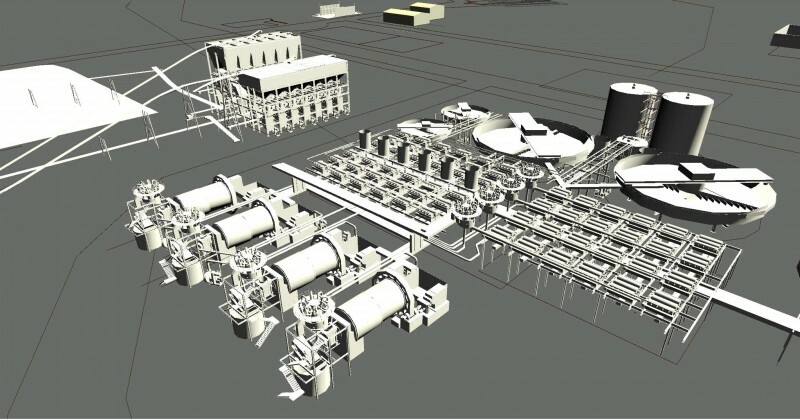 The estimates have been based on GHD’s conceptual General Arrangement Drawings, Process Flow Diagrams and other information obtained by the Company from independent consultants and suppliers. The accuracy of the cost estimates (±30 %) is in line with the level of detail available at the time of producing this study. The estimates for applied contingency and design growth, were on a line by line basis and averaged 16.5%. The process cost estimate relates to all equipment required for the production process. It includes comminution and concentration, along with all pumps, pipe work, motors and electrical components and transport equipment for slurry pipeline and dewatering near Broken Hill. The infrastructure cost estimate relates to all supporting elements of the mining and processing operation. Sustaining capital cost estimate is related to the necessary cost to refurbish or replace major pieces of equipment. It does not include the in pit conveyor and is less salvage value. The operating cost estimate relates to equipment and infrastructure maintenance, including process consumables and power consumption, separated into mining, processing and infrastructure operational costs. Transport cost estimates, including port, rail, and sea freight costs were provided by external operators or derived from first principles. Indicated Mineral Resources comprise 87% of the ore mined and processed in the early mine plan, defined as the first seven of twenty years and covering the payback period. Under the mine plan, the economic viability of the project is not reliant on Inferred Resources. The combined total resource mineral estimate of 348mt of concentrate will allow for an extended mine life beyond that studied should additional drilling confirm conversion from Inferred to Indicated resources. During the September 2016 drilling programme the conversion rate was 96%. The mining method utilises truck and shovel for the pre-stripping and the early mine plan, while in pit conveying (IPC) is utilised in year five once meaningful depths have been reached. The plan is to use the conveyor for the vertical lift and the trucks for horizontal movement, maximising the use of comparatively cheap electrical power, reducing truck hours and improving safety. Following a prestrip of ~150mt, the life of mine (LOM) waste:ore ratio is 0.40, dropping to near zero by year 11. 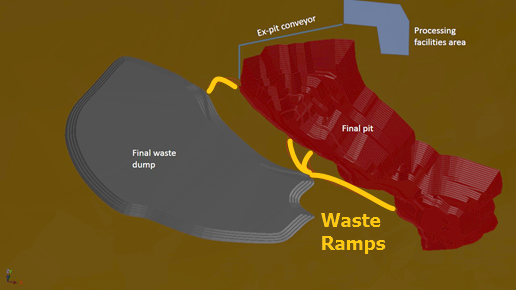 A total of 1406mt of ore and 568mt of waste are mined post pre-stripping. A maximum mining rate of 152mtpa is achieved in year 7. Results of an 8 tonne pilot plant run on a representative bulk sample. Nameplate plant design capacity of 10 Mtpa. The flow sheet has been developed largely based on an 8 tonne pilot scale test done at ALS iron ore technical centre in Perth. 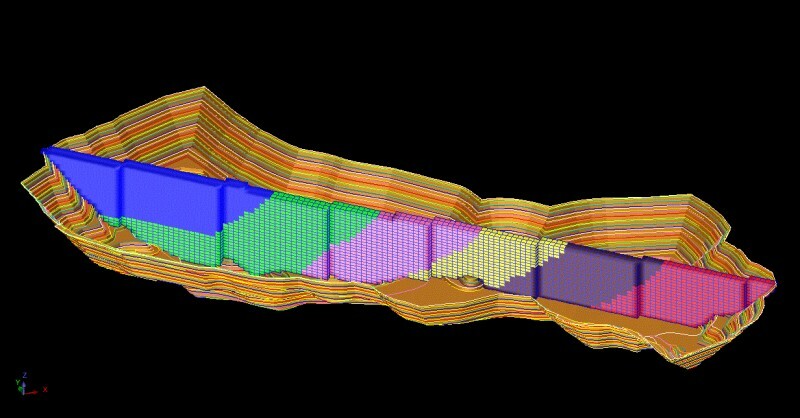 Under the mine plan, material is delivered to the plant at a LOM average of an estimated 14.2% Davis tube mass recovery (DTR) and concentrate grade of 69.8% Fe. Plant recovery on average is 14.1% DTR mass recovery at 70% Fe. The near 100% recovery reflects results achieved through the pilot plant test work. Typically, mineral concentrate recoveries are based on processing test work recoveries reported against pure elemental assays of the ore. However, the DTR test is a metallurgical recovery test and therefore high recoveries are expected. Test work included a representative sample from three mineralogical domains which all returned very similar results, establishing a relatively high degree of homogeneity across the ore deposit. Tailings will be thickened and pumped to a circular tailing storage facility and single cell and perimeter discharge will be utilised. Total power demand for the site has been determined by summing the total of all the electrical motors and applying the relevant usage factors. The total installed power for the project is 138MW, with an average power usage of 87.4MW over three load centres. The transmission line is a 220 kV single circuit line running from the Buronga to Broken Hill substations and is connected to the NSW transmission system via a single circuit 220kV line. This line has sufficient spare capacity to meet project requirements. 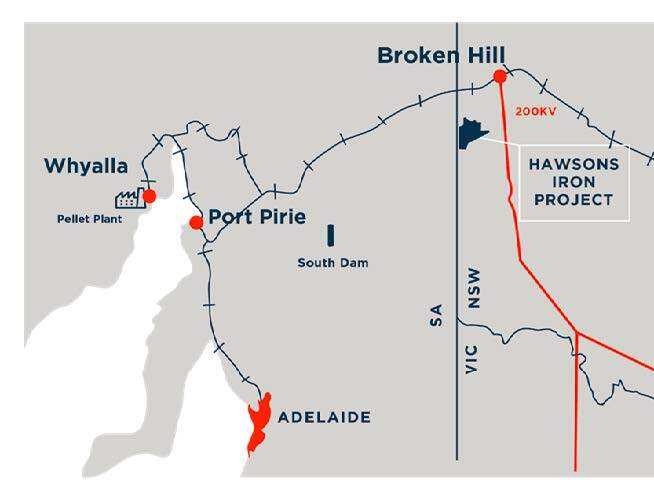 Power will be sourced from this line via a connection in Broken Hill and then distributed to the rail head, the mine site and the borefield (see figure above). Transgrid, the infrastructure owner, has advised that there is sufficient spare capacity available in the grid. Water will be sourced from a deep saline aquifer located 90km to the south of the site. Extensive sampling, pumping test work and hydrogeological modelling has identified sufficient project water. The water is available for allocation under existing regulations. Water will be pumped to site and a reverse osmosis plant will enable a fresh water stream for concentrate washing and product transport. Rail pricing and rail capacity information was obtained from below and above rail operators. Carpentaria was informed that sufficient rail capacity is available with small upgrades to the network in the form of extension of sidings. Port infrastructure was detailed in the earlier Port Pirie study in conjunction with Flinders Ports (refer ASX announcement dated 23 February 2015). Infrastructure required includes storage sheds, a pipe conveyor and a ship loader to allow product delivery to the existing port berths for transhipment in 17,000t payload barges to capesize vessels. Independent consulting group Shanghai Metals Market, following interviews with a large sample of the coastal Chinese steel industry, provided the pricing formula for the concentrate product. The formula was applied to long-term iron ore index rates that were supplied by an independent international consulting group. The base index for the revenue calculation was the average long term 65% Fe fines price. This resulted in a premium to the benchmark 62% Fe fines price of ~US$25/t. Carpentaria has current non-binding letters of intent to purchase up to 12mtpa of Hawsons Supergrade® product, and therefore a ready market has been established. The consensus outlook is for sustained modest long-term growth in steel demand, and CRU have identified that iron ore pellet feed/pellets are likely to be the highest growth segment of the iron ore market over the first ten years of mine life. This, it is argued, will primarily be driven by growth in Chinese pellet demand fuelled by consolidation and drive to increase productivity of the Chinese steel industry, but also significant expansion in the Middle East and Latin America. Carpentaria has lodged a mining lease application and is working to complete the secretary’s environmental assessment requirements (SEARs) to allow lodgment of the Environmental Impact Statement. No significant issues have been identified to date.